I like third grade so far. It’s fun. It’s also hard for me. I made new friends. I like my new partner Hannah. She is nice. I like math and art. And I like going on the computer.I like going on the xo, it's fun. Our principal is having surgery right now. So we have a substitute teacher. Her name is her Bledsoe. She is nice but I miss Dr.Coram. I am sorry she had to get surgery. I bet it is painful. Dr.Coram, I am new to this school, my name is Sofia. I am in Mr. Ahlness class and I hope you are ok. I want to say sorry. I hope you are ok.
My dog is a boxer. Her name is Alii. It means royalty in Hawaii. She is a nice dog. She is fun to play with and her favorite game is tug-u-war. My soccer team is named the Crush. We are good. We have not lost a game in a long time. And I have a friend on my soccer team. Her name is Sam. She is so nice. She just had a birthday. She is 9 now. I have two cats. Their names our Kilakila and Simon. They are inside and outside cats. But they most like it in the garage. Kilakila is orange and white. Simon is white and gray. My mom and dad are the nicest people. My dad works on the waterfront. And my mom works at Hairmasters at Westwood Village. I get free hair cuts. My weekend was so much fun. On Saturday I had a game. My team won!The score was 7 to 5. I scored 4 and my other teammate Ally made the other 3. But my other teammate were good too. I have 7 teammates on my team. And on Sunday I will just sit on the sofa and eat breakfast and drink orange juice. Webkinz is a.com. It is so much fun. I have 6 webkinz. My favorite webkinz is my pony, her name is Sugar. She was the pet of the month two years ago. My plans for Halloween are. My friend and I will go trick or treating. It is going to be so much. Then I will go to my sister’s birthday parity. It's going to be at the haunted house. Then my friend is going to have a party. She is having a Halloween party. I am going to be a Bad spirit and that is what I am doing for Halloween. What is on my mind today? I am wondering what my dog is doing. And am also wondering what my dad and mom are doing today. Am also wondering what I am going to do at recess. I’m probably going to play with my friends and that is what is on my mind today? I am wondering what my dog is doing at my grandma's house? And I am also wondering what I am going to do at recess? What we are going to do at music? Are we going to dance or are we going to sing? I think that Obama is going to win. Or maybe Mc Cain is going to win the election today. My whole family is voting for Obama. That is what I think about Election Day. When we found out that Obama won the score was 299 for Obama. And 123 for Mc Cain. When Obama won we were so HAPPY! My family loved his speech. And one other thing is that he will lower down the gas price. And Mc Cain had a speech too. It was so weird. Nobody likes it because they all wanted Obama. Beside the Mc Cain’s fans. At my house was crazy last night. My dad was so happy that Obama won. But my family was glad that that Mc Cain had a speech. My dad said that was the best speech that he has said. He was glad that he even had a speech. And that is what I think about Election Day. I feel good about report cards. I have never had a bad report card in my life. I don’t have mind yet but I feel nervous about report cards. I am doing good in school. So I know I will get money. My dad and my mom gave me money last year. I like report cards because so we know what grades are. You get good report cards in gym, music, math and more. Hi, I am a turkey named Sofia. It's three days 'til Thanksgiving Day. The farmer is going to cook me. I am nervous. Maybe I will hide from the farmer. I'll hide behind the cow, because I do not want to die and be his Thanksgiving dinner. So I am very scared, and terrified for what lies ahead. I want to see my friends and family, for it might be my last time. I didn't want to get cooked. Suddenly I saw the farmer coming and I ran as fast as I could. He didn't get me, I am safe, it is Thanksgiving Day! I am very joyful that I can be with my friends and family. The farmer took nobody and everyone was safe. The farmer and his wife were very happy and had a great Thanksgiving. And Sofia and her family were happy together and had a wonderful Thanksgiving Day. Ming is my stuffed animal. He is 1 year old. He is so special because I got him in Hawaii. I bought him a the swap meet in Hawaii. And Ming is a panda. And I love Ming so so so much. And that is Ming the panda. 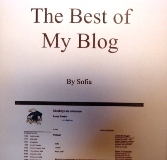 The reason that I called my blog Sofia's World is that when I was little my dad would call it my world. And that is why I called it Sofia's World. If it will snow tomorrow, I will make a snowman with my family, I will have a snowball fight with my friends and then I will take a shower. Then I will go on the computer and play games, And I will drink hot chocolate, and then go back outside, and that is what I would do if it would snowed tomorrow. My hoop shot is good. I am with Maya, and Rumi and our poster is going good. We drew Maya’s dog pinky. We are almost done. We named our team name pink because the dog’s name is pinky. I hope we win the Hoop shoot and we all have been working so hard on it. I was at home watching the Inauguration. Obama had his speech and it was long. And then when I got to school they were watching it too. Right now they are at lunch. Where Obama made his speech was at Washington monument. I loved his speech and it was so cool. And I also like when the three men played instruments. Obama did the thing where Obama put his hand on the bible. And I like his kid Sasha, she is the youngest one. It would be so much fun to ride in a limo. I think they are lucky. I also like the parade. I like when Obama and his wife walked down the red carpet. It was so much to watch the inauguration at school . We watched it all day. We watched during our entire subject. And that is what I have to say about the inauguration. And the Obama family. I have a dream that one day that it will be sunshine all the time in Washington. But not in the winter. Because I love the snow. I have a dream that one day all the kids will be friends. I have a dream that one day all the people that do not have food will get some and get a home. And that one day all the bad people would stop being bad and be nice. What is on my mind today is what we are going to do in music today. I hope it is fun. I am also wondering what my dog is doing. When I left home she was outside. I am also wondering what we are going to do in science today. I am also wondering what I am going to after school. And that is what is on my mind today. The best thing about early dismissal is that I get to go home early. That must be fun. And one more thing about the best thing is that I get to go to bed. I woke up so early. And then nobody does not need to wake me up. The worst thing is about going home is that we don’t have art today. And nothing else that I can not think about anything about early is that I do not know. What’s on my mind today is what my dog is doing at my grandma’s house. And I am also wondering what we are going to do in music. I hope Miss Bailey is here. And I am also wondering what kind of popcorn I am going to get. And Emma is going to take me up on the stage. I get free popcorn, that is so cool. I am also wondering what we are going to do in math. I hope we play a game. And that is what is on my mind today. I hope you are alright. You have been out forever. I wonder what is wrong. I hope it is not big. I wrote this because I want you to be our music teacher again. I mean Mr. White is all right but I think you are the best music teacher in the world. So I hope you come back, maybe see you next week. My weekend was good. On Saturday I did nothing but sleep in and that was great. My sister got sick so I had to take care of her. She gave me 20 $ dollars. And on Sunday I went to the Goodwill with my Grandma and Brother. Then we went to Dicks and that was great. And that is what I did on my weekend. My blog is doing well. I got 29 articles but I think I am going to write more? I hope I do well on writing more articles. I don't know what my next story is going to be about. So I have 29 articles and that is a lot of stories. I wonder if it will be about my family or other stuff. And that is what I have to write about my blog. My mind is on how my sister is feeling because she is sick. So she is sleeping with my dog in her bed room. My mind is also on what we are going to do in music and other stuff like that. And that is what my mind is on today. My mind is on what I am going to do on the nine day weekend and day. All I know what I am going to do is two things. Play soccer, and I think we maybe will go to YaKima and feed the animal. My favorite animal is the buffalo, you get to fed it bread. And that is what my Weekend plans are. My mind is on the Earth Day Bags. Mr. Ahlness and we are in charge of it. We get to take it to Safeway. We are not walking to it but it is close. It is on Roxbury Safeway. My mind is also on when we are going to finish our bag. I think we are going to finish it today. That is why we do not have any science today. On Sunday I went to Build-a-bear workshop. It was so much fun. I got a monkey. It was pink with hearts on the stomach. I named her Hearts because she had hearts on her. I registered my monkey at the place. Where I got her was at Bellevue mall. The mall was big. You get to dress it, wash it, and you get to make a wish to the heart and you put the heart in there stomach. Your wish might come true. My monkey is so soft, squashy cute, and cuddly. I love her so much. I have a dog at home so I won’t let my dog get hearts. After you are done and you have registered it, you get a special box to put your animal in. There is a door and you can open it and you can see your build-a-bear. How I dressed my little hearts was. I got a two piece. I got some pants and I got a shirt too. The shirt has some flowers on the. It is also pink and white. And the pants were just pink and with some sparkles. My Earth Day bag will look like. It will have a green and blue earth on the middle of the bag. It will also have words on it like save our world, always recycle. It will look pretty and colorful. I am not done. And on the top left corner it has a sun with shiny stuff. And it will have small heart. And that is how I would describe my colorful and pretty Earth Day bag. Mr. A said we can do another bag because we are in charge, well Mr. A is. My 2nd bag is better than the first one I made. I like it way better. Because the back round it had to many colors. And on my 2nd bag I am not doing a background. And Mr. A also said that if we make a 2nd bag only one can go in the contest. Oh I forgot that there is a contest, I hope I win. I would be so happy . And it would be cool to win. And at the end there is a prize. It is going to be so much fun. Awesome. What I think about the WASL is I don’t like the WASL. I don’t even know why we take it. I mean it is not for a grade so why should we take it. And the subjects are reading and math. We already did the reading part. I hope when we get the math part it is going to be easy. I am already good at math. So I think the math is going to be easy for me. But I don’t know about the other kids. The WASL means Washington Assessment of Student learning. And that is what I think about the Wasl. Today we started a new subject, it is math. It is so easy it is not hard. Today’s snack was carrot and cheese sticks but no juice. The cheese had High School Musical. I don’t know if other school takes the WASL. Mr. A said I wonder if other schools take it and what they call it. I don’t know what kind of snack we are having tomorrow. What I think about the WASL today is that it is every body finished today and that is good. Today’s snack was some juice, ritz bits, and some of the oranges from the first time we started. All of our subjects were reading math. All I think about the WASL is that it was fun and boring. Especially when you get done early. And that is what I think about the WASL. M weekend was great. On Saturday morning I did nothing but at 4:00 I played with my sisters team. My dad wanted me to play with them. Then we did a scrimmage with the older girls. I made one goal that is why because they were hard. And on Sunday I went to my sister’s soccer game at 10:00 in the morning. It was at Star fire. They won but I did not watch it because they are games I played a lot. And then at 2:30 my sister and I both had a soccer game and we both won. And that is what I did on my fun weekend. My mind is on the earth day party. And what we are having for food. I hope we are having sweets, soda, chips, now that’s a party. We are having the party at 2:00 P.M.
My mind is also on when I am going to get an earth day bag I hope I get one soon. My mind is also on. Oh ya it’s Earth Day. My mind is on grandparent’s day. Because my grandmother is coming. And my partner Rumi’s grandparents are coming too. And that will be so fun and cool. And it’s on Friday the 8. And I don’t know what time it starts. My mind is also on nothing. And that is what my mind is on right now and Friday. Because that is when grandparent’s day is. The state I want to go is nowhere. Because I've already been to every state. Well I do want to go to Florida. Cause there is Disney world. And my aunt lives there and she has a pool and an ocean view. And it is so beautiful when the sun goes down. And I don’t want to visit any other state. But in Hawaii I have a house. And all my aunties and uncles live there and where I live there is a beautiful view. Like Florida where my aunt lives with the swimming pool. The last time someone did something nice for me was when I was 7 years old. It was my birthday party. And it was a surprise party. IT WAS SO COOL. My mom, my dad, my sister, and my brother helped with it and all my friends came and aunts and uncles. That was very nice of them to do that. I had a bouncy house, and a piñata, it was a tiki, a big fudge chocolate cake. It was awesome. And when that was over it was present time. I got a lot of presents. And I could not tell which one was my favorite one. And that was the lasted time someone did something nice for me. My plans for the weekend are on Saturday I don’t know what is going on but whatever I do I hope it will be fun. But on Sunday I am going to pick my mom from the airport. She just came back from California. And then my sister has a soccer game but I don’t know what time it is going to be. And when my mom comes back from the airport we are going to celebrate mother’s day with her. She comes back on Sunday on Mother’s Day in two more days. I don’t know what time my sister’s soccer game ends and so we can go to Mother’s Day. In roomtwelve we are doing cursive. Cursive is a different kind of letters. We are on the letter t right now. We just finished the letter t so know we are on the letter u. We have to do the whole alphabet. I hope your peoples schools are doing it too. My young authors book is done already and it is good. I was done on Tuesday. Almost everyone is done with the young author’s book. Room 9 is not doing articles. They are doing poems. Because they do not have blogs, so they did poems. I don’t have all of my pictures for all the stories. I have 9 pictures but I have 10 articles. My thing is awesome. I was the third person to finish. The hardest part was when like people would lose their part of the young authors book. I lost it so many times that, was really hard. How I did it was first we did the illustrations. We did that together. Then our teacher would split the class in half. Then half of us would go on computers. Then our teacher would put our cover and our pictures and articles in our young authors book together. And that is how I did my young authors book. The name of my young author book is The Best of My Blog. And I am proud of it too. My mind is on the Hoop Shoot party. It is today. I hope it is going to be fun. I don’t know where it is. And also on the bikes. That is today too. Today is going to be a fun day at school. I think this is going to be the best day ever at school too. And my mind is also on nothing. And that is what my mind is on today. The best day ever at school. My blog is good and fine. My font and color is great good and neat. Almost all of my articles are in different font or color. The first article I wrote was Dr Coram, because she went to the hospital cause she had to get surgery. And then I wrote so far in the beginning of the year when I was a new kid. I will miss Mr. A., and Mr. A. being our teacher was so awesome. He was the best boy teacher I have ever had. And he is my only boy teacher I have ever had before in my life. My goal is 69 articles this year. I hope I will reach that much. I only have 41 articles so far so it will be no problem to reach that many. I think others should not have a blog, only room twelve should have one. We are the best. Hi my name is Sofia. I am an 8 year old girl. I have 1 dog 2 cats and I might get a puppy in Hawaii and I like watermelon and pizza. And my favorite animal is a monkey.